MXI-Express x1 is based on PCI Express technology. 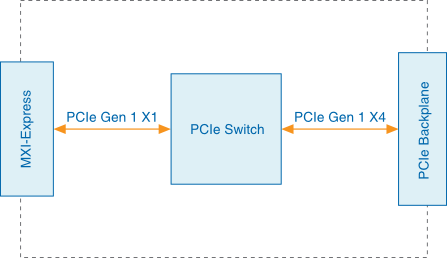 A MXI-Express x1 kit may use a combination of PCI Express switches or PCI Express-to-PCI bridges to enable control of a PXI or PCI Express chassis from a PC with an available PCI, PCI Express, or ExpressCard slot. The bridge architecture is transparent to device drivers, so no additional software is needed for CompactPCI level support for PXI or PXI Express devices in connected chassis. For full PXI/PXI Express functionality such as chassis and controller identification, trigger routing, and slot detection, install the PXI Platform Services software included with your kit. You also can find this software at ni.com/updates by searching for PXI Platform Services. The link between the PC and the chassis is a x1 cabled PCI Express link. This link is a dual-simplex communication channel comprised of a low-voltage, differentially driven signal pair. The link can transmit at a rate of 2.5 Gbps in each direction simultaneously. This port is not compatible with the cabled PCI Express specification developed by the PCI-SIG. The BIOS of some host machines may not support the extension of the PCI Express fabric or PCI bus. Because this is the primary function of MXI-Express x1 products, those systems may not boot or function correctly. To address this issue, certain MXI-Express x1 products have additional functionality intended to hide all PCI or PCI Express resources connected to the host machine, and allow NI MXI-Express BIOS Compatibility Software to handle the enumeration process of these resources instead of the BIOS. In the cases where this software is required, you may need to toggle a dip switch on the board as described in the software documentation. Only the first dip switch is for this purpose. The other switches serve no function; leave them in their default position. Unless NI MXI-Express BIOS Compatibility Software is installed on the host machine for use, the BIOS Compat Mode dip switch (switch 1) should remain in the off position. If this mode is enabled on a MXI-Express x1 product in a host machine that does not have the software installed, the operating system does not detect the connected devices. For more information about host system compatibility with MXI-Express x1 products, refer to the Tips to Help You Successfully Use MXI-Express Controllers document at ni.com. 1 On certain legacy MXI-Express x4 products containing the dip switch package, the secondary switches may serve a reserved purpose.